1936 Bugatti Type 57SC Atlantic. Design created by Jean Bugatti, son of the founder of Bugatti, Ettor Bugatti. In the SC variant, "The 'S' stood for 'Surbaissé' ('Lowered') and the 'C' for 'Compresseur' (a supercharger introduced by Bugatti as a result of customer's desire for increased power)." The body is aluminum. Only four of these were built. One disappeared in France during World War II. Another was hit by a train (!) but has been completely restored. 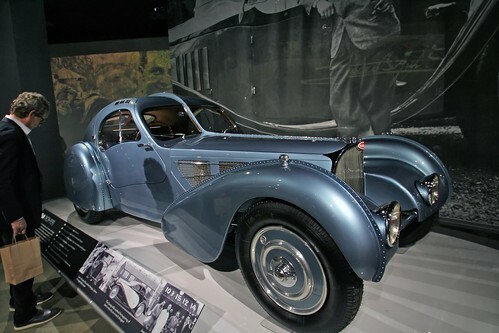 This particular 1936 Bugatti Type 57SC Atlantic was brought to New York City in 1946. The owner drove it from there to Los Angeles. Some time in or after 2003 it was bought by Peter Mullin for a figure greater than $30 million. The fourth vehicle is owned by Ralph Lauren, who paid $40 million for his. 1939 Bugatti Type 57C by Vanvooren. This vehicle was a gift from the nation of France to Mohammed Reza Pahlavi, Prince of Persia, on the occasion of his wedding to Egypt's Princess Fawzia in 1959. 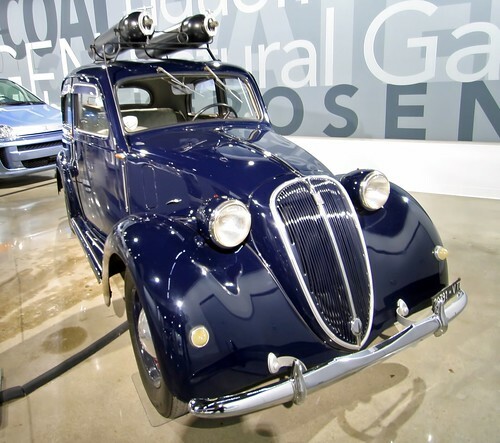 1939 Fiat 508C Balilla converted for CNG. This is said to have been the very first vehicle powered by compressed natural gas. 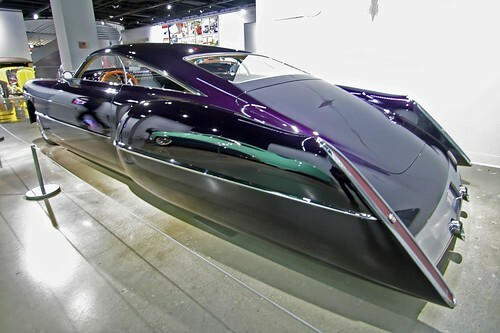 1948 Cadillac Sedanette Cadzzilla by Hot Rods By Boyd. This unique customization was commissioned by Billy F. Gibbons of ZZ Top. 1948 Davis Divan. This is a three-wheeled convertible made by Davis Motorcar Company in Van Nuys in the late 1940s. There were 13 of these made, and 12 of them still exist. 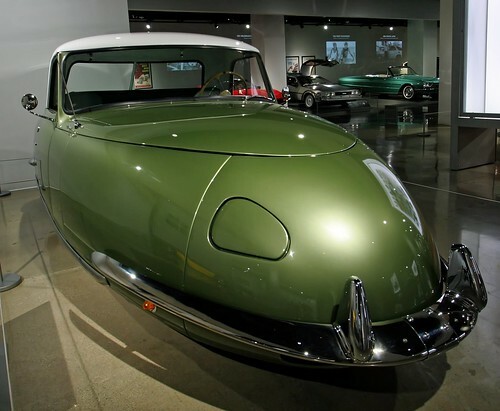 The design was based on an earlier three-wheeled car called "The Californian." Later, Gary Davis designed the 3-wheeled Dodge 'Em bumper car which is now ubiquitous in carnivals everywhere. He eventually retired to Palm Springs where he died in 1973. 1955 Chevrolet Biscayne XP-37. This vehicle was created by General Motors to show off its new 265 cubic-inch "Turbo Fire" V8 engine. 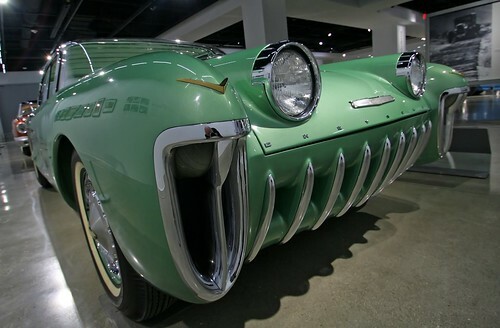 1955 Mercury D-528 Concept. The bulging "fins" are functional...and hinged. One is for the spare tire, the other holds the gas tank. 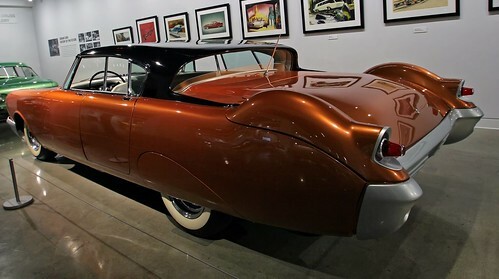 This car had Ford's first reverse-sloping retractable rear window. "'Beldone' was a stage name selected by Paramount Pictures for the car's appearance in the 1964 Jerry Lewis movie, 'The Patsy', not an official Ford designation." Here's a room in the Petersen museum where the unifying theme seems to be "shiny silver." Far to the back, not really visible in this photo, is a shiny gold car. The chassis of a 2015 Tesla Model S P85D. Below is one with its clothes on. Evidence of Petersen's attempt to class up its act. 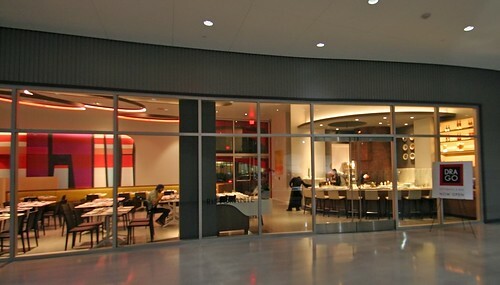 This restaurant (in the museum) used to be a Johnny Rocket's. Now it's a Drago. Many more photos can be seen here.